With the advent of the Kindle and other e-readers and digital devices, books are undergoing a profound change. But a quieter, parallel and low-tech revolution has been happening for years in the realm of artists’ books. Influenced by avant-garde typography, printmaking and sculptural ideas, artists have transformed traditional books into their own genre of visual art. Nearly 60 examples of artists’ books make up “Beyond the Text: Artists’ Books From the Collection of Robert J. Ruben,” currently on display at the University of Vermont’s Bailey/Howe Library. The exhibit includes printed ephemera, books with accordion folds, pop-ups and scrolls, and finely bound and boxed book editions. The show’s selections reportedly represent about a tenth of Ruben’s collection; the New York otolaryngologist acquired artists’ books over six decades. “Remember!” by Frans Masereel and “Wij maken Geschiedenis” (“We Make History”) by Robert Ziller are the oldest pieces in the exhibition, both dating from 1946. The Ziller book pairs a quote from Adolf Hitler — “Everything I am, I am through you, and everything you are, you are through me” — with grotesque caricatures of Hitler and Nazi leaders Heinrich Himmler, Rudolf Hess and Ernst Röhm on the facing page. “Remember!” is a book of dark illustrations recounting the horrors of concentration camps and the deprivations of warfare, in the tradition of Spanish painter Francisco Goya and German artist Käthe Kollwitz. Both of these books seem to be attempts to exorcize the demons of 20th-century Europe. “A Literary Bestiary,” by Uruguayan-born American artist Antonio Frasconi, alludes to medieval bestiaries, or illustrated catalogs of creatures — including fanciful ones. Frasconi’s woodcuts of animals are intertwined with the first letters of their names on pages facing sophisticated literary quotes about the beasts from a range of sources. “Sanctae Hildegardis: Circulus Sapientiae” (“Circle of Wisdom”), by distinguished Vermont printmaker Claire Van Vliet, also has roots in the Middle Ages. Hildegard von Bingen was a multifaceted 12th-century composer, writer, prioress and mystic whose work remains inspirational. Van Vliet quotes texts by von Bingen in a vibrantly colored accordion book. It incorporates brilliant pop-ups informed by the illuminated manuscripts that von Bingen oversaw, along with Latin originals and English translations of her hymns. “House of Cods” by Linda Smith, with poems by Carol Schatt, also seems lighthearted, but in fact informs viewers about the acute environmental issue of overfishing. 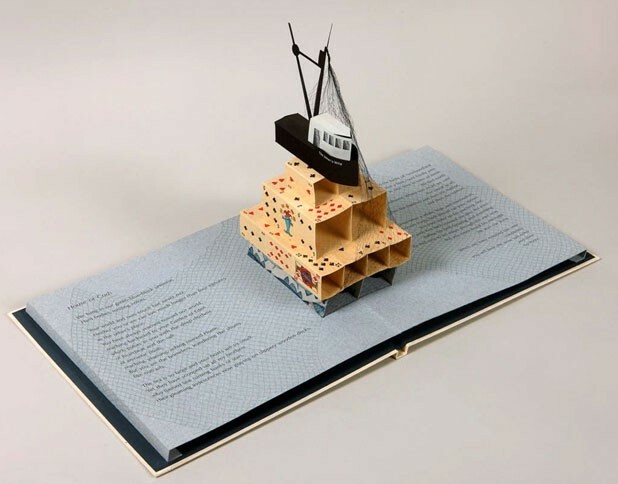 In the exhibit, the book is opened to reveal a tall, pop-up house of cards capped by a commercial fishing trawler. It’s beautifully made, with a variety of exotic papers. Schatt’s poetry is often poignant — and sometimes presents the point of view of the decimated fish: “You found us all, / and then the haddock and then the halibut / and then the salmon.” Fisheries, these artists seem to suggest, are collectively a house of cards on the verge of collapse. In 1450, Johannes Gutenberg’s printing press sounded the death knell of the illuminated manuscript, but contemporary artists’ books reintroduce to bibliophiles the notion of visual artistry. The Bailey/Howe exhibition is full of intriguing ideas that indeed go beyond the text.